"Watch out!" squealed my ten-year-old cousin, Amber. "They're terrorist chickens!" I was plonked on the asphalt driveway of my aunt's home, trying to snap some pictures of her "pet" chickens. "They are!" Amber enthused, as my other cousin Alex fluttered about herding the browny-orange birds in the direction of my lens. "This wild rooster got in, and got them excited, and bit me on the bum!" she said. "I kicked it away, but it came back, and bit me again!" "You got bitten on the bum by a Wild Rooster Terrorist Chicken - twice?" "Yes!" she nodded. "So what makes these chickens terrorist chickens, then?" I asked. "Oh, they're all the same!" was the reply, as she scrambled for safety into the passenger side of her parents' car and slammed the door behind her. "Oh, they're all the same!" was the reply.."
Ouch. Glad to see schools are doing their bit for multiculturalism. Foul Qaeda. That, without a shadow of a doubt, is not Comedy Gold but Comedy Platinum. 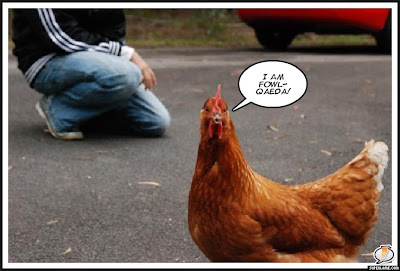 Fowl Qaeda is magnificent punage. Do Fowl Qaeda Imans issue Cluckwas?